Review by AllTheBestFights.com: 2018-06-09, good fight between Jeff Horn and Terence Crawford: it gets three stars. Both undefeated, the former Olympian and current Wbo Ww champion Jeff Horn entered this fight with a boxing record of 18-0-1 (12 knockouts) and he is ranked as the No.1 welterweight in the world while his opponent, the former world champion in two different weight classes Terence Crawford, has a perfect record of 32-0-0 (23 knockouts) and he entered as the No.1 super lightweight. In their last three fights Jeff ‘The Hornet’ has won over Ali Funeka, Manny Pacquiao (Pacquiao vs Horn) and Gary Corcoran (Jeff Horn vs Gary Corcoran) while Crawford has beat John Molina Jr (Crawford vs Molina Jr), Felix Diaz (Crawford vs Diaz) and Julius Indongo (Terence Crawford vs Julius Indongo). The only man who stopped Horn in a draw was Rivan Cesaire in 2013 but it was a technical draw since Cesaire suffered a cut, after one year Horn beat him via tko. 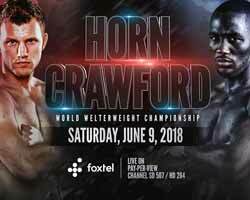 Horn vs Crawford is valid for the WBO World welterweight title (Horn’s second defense). Watch the video and rate this fight!